P/O ANDREW CHARLES MYNARSKI - V.C. Aircraft took off from RAF Middleton St. George on attack of the rail yards at Cambrai, France. Aircraft failed to return from this operation. On the run in to the target they were attacked and severely damaged and set on fire by a Night fighter. The order to abandon the Lancaster was given and P/O Mynarski was making his way back to the door when he saw the rear gunner, F/O Brophy, trapped in his turret. With total disregard for his safety, P/O Mynarski made his way through the flames to try and assist the rear gunner. Despite all his efforts, the turret could not be moved and P/O Brophy motioned Andrew away to save his own life. Back through the flames he crawled, with his lower clothing and parachute burning, he turned, saluted his friend and bailed out. Witnesses on the ground watched this man’s decent to the ground with his clothing and parachute still burning. Attempts were made to save Andrews life, but in the end, he died shortly after due to severe burns. The Lancaster hit the ground and F/O Brophy was thrown from his turret without injury. This act was brought to the attention of higher authorities, and P/O Andrew Mynarski was bestowed the Victoria Cross, the British Commonwealth’s highest award for bravery. Flt Eng: Sgt R. Vigars, RAF, Survived, Captured, P.O.W. Bmb Aim: Sgt J. Friday, RCAF, Survived, Captured, P.O.W. 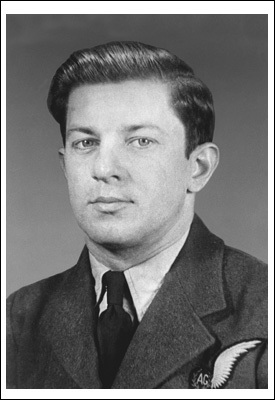 Gnr: P/O A. Mynarski (VC), J/87544, RCAF, Winnipeg, Manitoba, Canada. Lest We Forget - Remember Them Always ! Re: P/O ANDREW CHARLES MYNARSKI - V.C. Temujin, could not read the story on this Warrior, and just let it go ! Had to share for those that might not have known !